So I think if my kids had to pick a favorite food it would easily be mac and cheese. Pretty much any time I’m not sure what I’m going to make for supper, my oldest asks for macaroni. And my 20 month old probably would if she could. But since we’ve been on a big taco kick lately (did you see these Baked Cheeseburger Tacos?!? ), I wanted to infuse some macaroni and cheese with big Mexican flavor! In some ways, I am a big planner. I plan almost everything out well in advance. Most of my recipe ideas I have planned well in advance. But where my planning usually falls through is in buying or preparing my ingredients. Which means I am forced to improvise because I am never willing to just give in and change plans or put something aside until I am properly prepared, which is why I ended up The Recipe Rebel! Out of pure stubborn determination not to let my plans go unfulfilled. And so, I was planning to make a taco beef to stir into this mac and cheese, but I had no beef. Rather than rearrange plans, I stubbornly stuck with it and decided that meat was not a requirement in this mac and cheese. And really, there is so much flavor going on with the salsa and taco seasoning that I think you really don’t miss it! The plus side I guess is that most of the recipes you’ll find here are simple to prepare and full of simple ingredients — bonus if you have kiddos who want to help out! 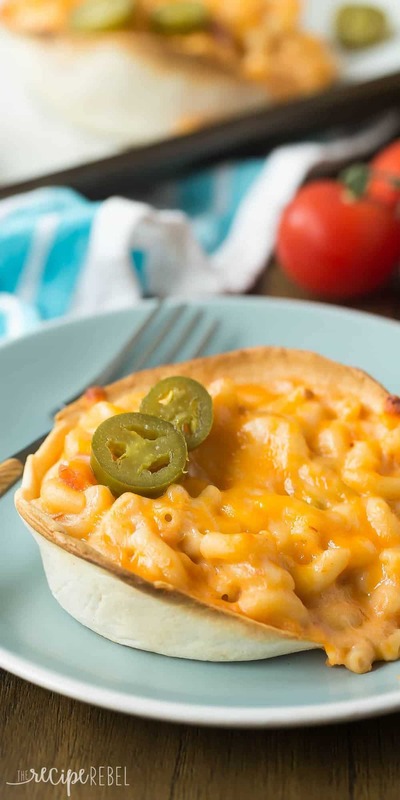 My oldest girl loved scooping the mac and cheese into these tortilla bowls! If you have picky kids or some people who like things spicier, you could even customize each bowl to suit each person (I’ve given you lots of ideas for extras in the recipe!). I thought it would be fun to bake this mac and cheese in the new tortilla bowls from Old El Paso — they are so fun for the kids and once they cool a bit, you can even pick them up and eat them handheld. You could stuff them with anything and the kids would be all over it! Because the pasta and sauce is cooked beforehand, you can easily make this ahead for a busy weeknight dinner! Simply prepare your mac and cheese, and refrigerate until you’re ready to bake (further instructions in the recipe!). This way you don’t have to wonder what’s going to be for dinner after the family gets home from work and school — it’s all ready to go! The family can still enjoy a homemade meal together even on the busy nights, and if you have an older child, he or she can probably finish this meal off on their own. *Tip: if you want to make this a meal in one and amp up the protein, feel free to stir in black beans or cooked ground beef! 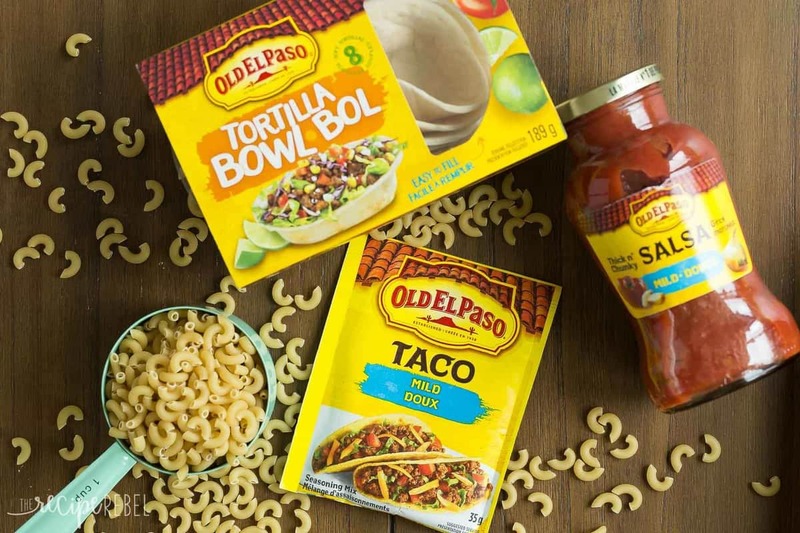 *This post is sponsored by Old El Paso as part of my brand ambassadorship with them! Thank you for supporting the brands that help me bring you the easy, weeknight dinners you need! 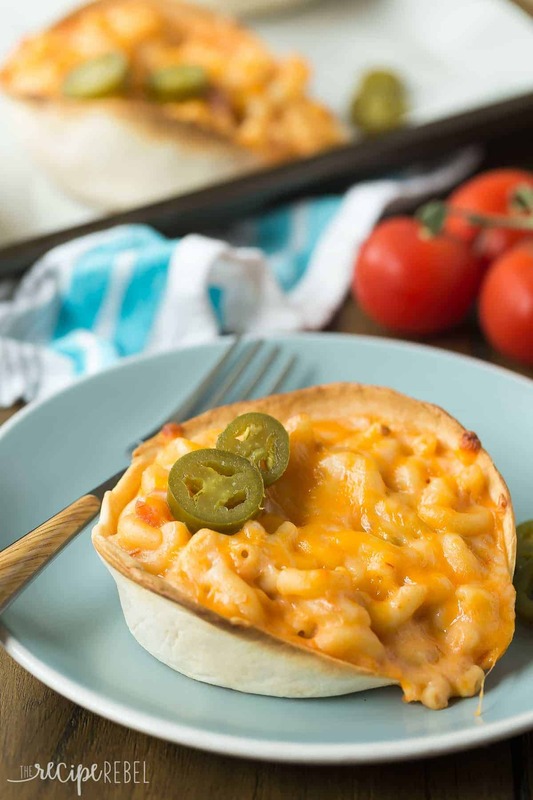 This Mexican Baked Mac and Cheese is packed with flavor from taco seasoning, salsa and baked in a tortilla bowl for a fun twist on taco night! The kids LOVE it! Cook all macaroni according to package directions, except be sure to leave the pasta with a little bite -- about 4-5 minutes in boiling water. Drain and run under cold water until cool. Set aside. In a large skillet over medium heat, melt butter. Add the flour and stir until combined. Cook 1 minute. Add the taco seasoning and salt, stir and cook 1 minute. Slowly stir in milk with a whisk. Cook over medium heat, stirring often, until thickened -- about 5-10 minutes. Stir in salsa and 2 cups cheese until cheese is melted. Add the pasta and stir until combined. 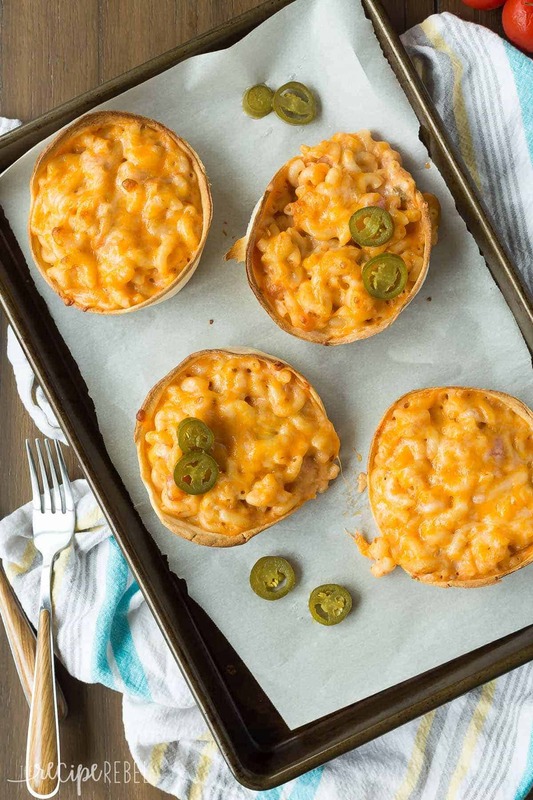 Place tortilla bowls on a parchment lined baking sheet and fill with macaroni. Sprinkle with remaining 1 cup cheese and bake 10 minutes, until bubbly and cheese is melted. Serve with additional taco toppings (jalapenos, extra salsa, avocado) if desired. *To make ahead: cool pasta as recipe instructs. Cook sauce and cool to room temperature. Stir together pasta and sauce and refrigerate until ready to use. Fill tortilla bowls and bake at 350 degrees for 20 minutes or until bubbly -- covering if they brown too quickly if necessary. Cook all macaroni according to package directions, except be sure to leave the pasta with a little bite — about 4-5 minutes in boiling water. Drain and run under cold water until cool. Set aside. Slowly stir in milk with a whisk. Cook over medium heat, stirring often, until thickened — about 5-10 minutes. *To make ahead: cool pasta as recipe instructs. Cook sauce and cool to room temperature. Stir together pasta and sauce and refrigerate until ready to use. Fill tortilla bowls and bake at 350 degrees for 20 minutes or until bubbly — covering if they brown too quickly if necessary. I want a big tortilla bowl full of this mac and cheese! I love that you combined two of my loves – mac and cheese and mexican food! I bet this would be a hit with my kids, too! Hi Ashley! Very creative! I’ve seen the tortilla bowls but haven’t used them yet. I home can my own salsa and I also make my own taco seasoning because most packets are just too salty for me. Who could pass on mac n’ cheese? Not me! They are so fun — I love everything you could fill them with! Thanks Dorothy! Don’t sat “pass” around an older person! 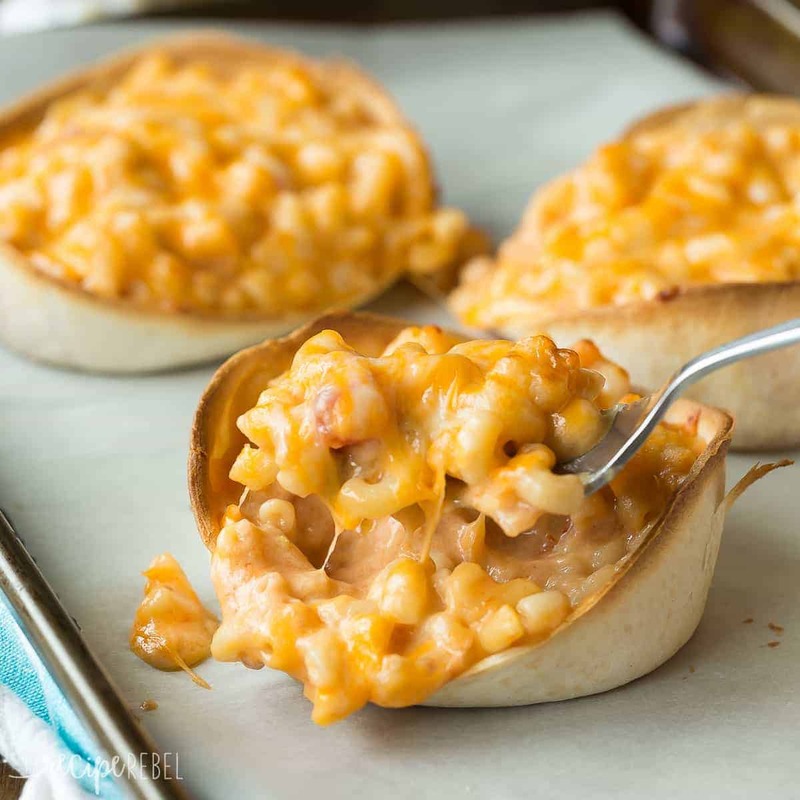 This sounds like mac and cheese heaven! It’s so creative to add in taco seasoning! !